Walker & Dunlop, Inc. (NYSE: WD) announced today that it originated loans totaling $183 million for Park Chelsea and 2M, two LEED certified multifamily properties in Washington, D.C. Walker & Dunlop is one of the most active lenders utilizing environmental rewards programs to obtain pricing breaks and structural enhancements for its clients owning and developing properties that meet certain sustainability requirements. Walker & Dunlop Managing Directors Brendan Coleman, Keith Melton, and David Strange led the origination team, which arranged the transactions through Fannie Mae’s Green certification execution and the U.S. Department of Housing and Urban Development’s (HUD) refinance program on behalf of repeat borrower WC Smith, one of the leading developers of affordable housing in the Mid-Atlantic region. Chairman and CEO of WC Smith, Chris Smith, stated, “The Walker & Dunlop team’s expertise and deep understanding of the nuances of Green financing options available in the markets resulted in major savings for our company. This ultimately enables us to reach our goals of providing the local community with muchneeded housing options.” 2M is a LEED Gold certified, mixed-income rental community in NoMa, a prime location near historic Union Station. 93 of 2M’s units are dedicated to low income tenants, including Section 8 voucher holders. The refinance loan will provide very significant annual debt service savings for WC Smith, just two years after closing the original HUD development loan. The property was 99 percent leased at closing, demonstrating the area’s strong demand for affordable rental options. 2M also features upscale amenities including a rooftop pool, grilling area, indoor fitness center and basketball court, and 24-hour concierge. Park Chelsea is the first of three properties that will be known as The Collective, a rental community located in Washington, D.C.’s Capitol Riverfront. As a LEED Silver building, the property qualified for Green Building Certification financing, which enabled Walker & Dunlop to structure discounted pricing, maximize loan proceeds, and achieve an accelerated closing timeline. 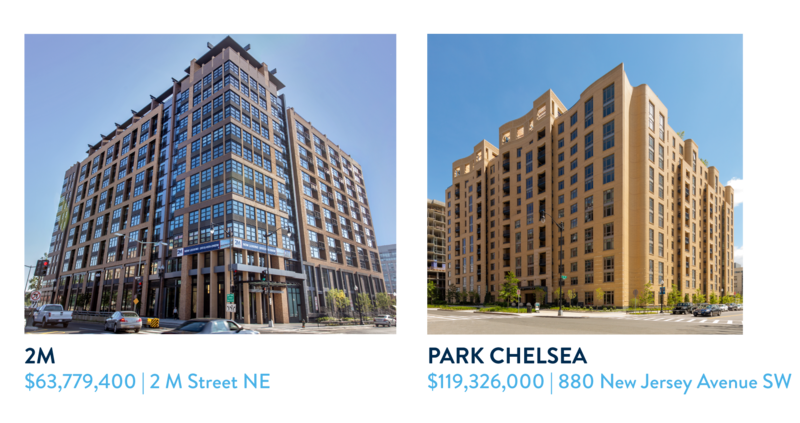 Park Chelsea was 75 percent leased at closing and has been so successful since opening that it was awarded Delta Associates’ 2016 best lease-up pace for a D.C. apartment community.